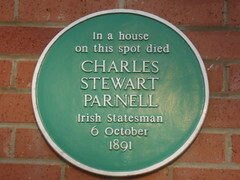 Charles Stewart Parnell (Irish: Cathal Stiúbhard Parnell; 27 June 1846 – 6 October 1891) was an Irish nationalist politician and one of the most powerful figures in the British House of Commons in the 1880s. 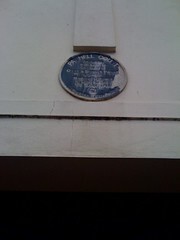 Born into a wealthy and powerful Anglo-Irish Protestant landowning family, he entered the House of Commons in 1875. He was a land reform agitator, and became leader of the Home Rule League in 1880, insisting on operating independently of the Liberals, and winning great influence by his balancing of constitutional, radical, and economic issues, and by his skillful use of parliamentary procedure. He was imprisoned in Kilmainham Gaol in 1882 but, a very capable negotiator, was released when he renounced violent extra-Parliamentary action. That same year he reformed the Home Rule League as the Irish Parliamentary Party, which he controlled minutely as Britain's first disciplined democratic party. The hung Parliament of 1885 saw him hold the balance of power between William Gladstone's Liberals and Lord Salisbury's Conservatives. His power was one factor in Gladstone's adoption of Home Rule as the central tenet of the Liberal Party. His reputation peaked in 1889-90 when letters published in The Times linking him to the Phoenix Park murders of 1882 were shown to have been forged by Richard Pigott. 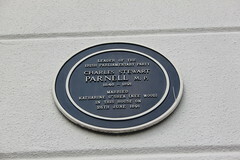 However, the Irish Parliamentary Party split in 1890 after the revelation of Parnell's long adulterous love affair, causing many English Liberals (many of them nonconformists) to refuse to work with him, and strong opposition from Catholic bishops. He headed a small minority faction until his death in 1891. Gladstone described him as: "I do not say the ablest man; I say the most remarkable and the most interesting. He was an intellectual phenomenon." Liberal leader H. H. Asquith called him as one of the three or four greatest men of the 19th century, while Lord Haldane described him as the strongest man the House of Commons had seen in 150 years. Historian A.J.P. Taylor says, "More than any other man he gave Ireland the sense of being an independent nation."